Reuters reports that many workers have taken to the streets and have been joined by students. Government buildings and the police have been attacked and confrontations continue. Unemployment is officially 27.5% in Bosnia (officially) and the ruling cliques here are widely seen as gangsters. It's early and we should be careful but this looks to be different from events in Ukraine which is subsumed in nationalism and inter-imperialist rivalries. I've heard that in the city of Mostar, where ethnic tensions have been very high for the last 15 years, the HQ of the nationalists have been burnt. Some Bosnian comrades are keeping /r/anarchism on reddit updated if you want to find out some more. It sounds like revolution to me. Markunin, I think it's still a long way from revolution. The different nationalists are the ruling parties so burning their HQ is not necessarily a rejection of nationalism. A hopeful sign is that there have also been riots in the mostly Serb populated city of Banja Luka as well. And some pretty intense photos from the BBC. But yeah, any more info about what's going on would be great! During the unrest on Friday, 7 February, the mayor of Brčko was taken hostage by the crowd for a short while and then released. By the morning hours of Saturday, 8 February, the riots had spread to Brčko, Mostar, Banja Luka, Jajce, Bihać, Prijedor, Travnik, Bugojno, Donji Vakuf, Kakanj, Visoko, Gračanica, Sanski Most, Cazin, Živinice, Goražde, Orašje, Srebrenik, Prozor and Tešanj, among others. I have to say, it usually makes me uneasy to see protesters and police fraternising like that.. even if it's probably something desirable, I just can't image it happening unless a) there's a complete meltdown of the state or b) there's something dodgy about the protest.. though that's just gut feeling, nothing rational, like..
Today in Tuzla a new future is created! The government has submitted his resignation, which was the first demand of the demonstrators and thus creates conditions for further solving of the existing problems and the fulfillment of the rest of the workers’ demands. Accumulated anger and rage are causes of the violent behavior. 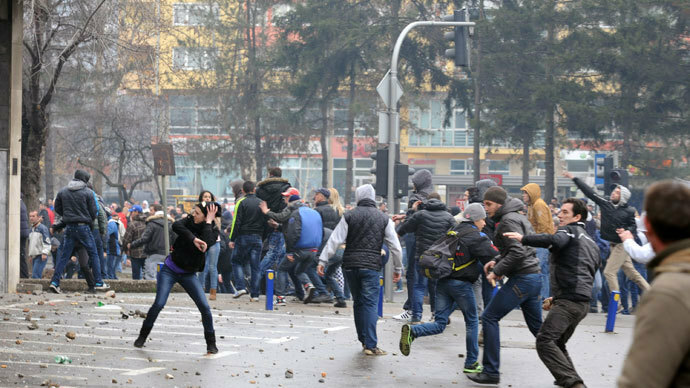 The attitude of the authorities has led to the fact that the situation in Tuzla escalated. Now, in this new situation, we have to focus this anger and rage on building a productive and useful system of government. 1. Maintaining public order in cooperation of citizens, police and the civil protection, to avoid any criminalization, politicization and manipulation of any protests. 2. Establishing a technical government, made ​​up of professional, non-political party members, uncompromised people, who have not had a single mandate in any level of government, which would lead the Tuzla canton to the election of 2014. This Government shall have the duty to submit weekly plans and reports on the activities and achieve the given objectives. Work of the Government will be monitored by all interested citizens. ◦ return the factories to the workers and place them under the control of public authorities in order to safeguard the public interest, and start production in those factories where possible. 5. Balancing the salaries of government representatives to the salaries of employees in the public and private sectors. 6. Cancellation of additional payments to the representatives of government, as personal income, on the basis of participation in commissions, committees and other bodies, as well as other unreasonable and unjustified compensations that workers in the public and private sectors don’t have. 7. The abolition of wage to ministers and possibly other government officials, who are getting wage payments after the expiration or termination of their mandate. This Proclamation is brought by the workers and citizens of Tuzla Canton, for the good of us all. Dunno how to go beyond point 2 though. Proposing that all decisions of the technical commission be submitted to a district co-ordination of workers' councils? I'm not at all sure about some of the demands of some of the worker/protesters but I think that this is very much a different kettle of fish from the depressing events in Ukraine. There's been a head of discontented steam building up among the working class in this divided region and was expressed in a pit occupation by miners in Bosnia last September over wages, and against the government owners of the pit. Some of the reports from the press in the last few days expressly talk about "solidarity" from other towns with the workers of Tuzla. As Bastarx suggests above, the support from workers of the Bosnian Serb capital, Banja Luka, are welcome. Nationalism will always be a danger here, but there does appear to be some clear anti-nationalist sentiment and clear proletarian concerns. There have have been protests by students in Kosovo for a few weeks now, ostensibly against a cheating university management but which reports again link to rising unemployment (around 40%). Nato troops (KFOR), have been training for action against protest movements in the command centre at Hohenfels in Germany and Germany has had a particular interest in Kosovo since the war in the 90's. But a developing class struggle can push these imperialist interests to the background. Sarajevo is rising again | Police brutality has awakened the wrath again! Today, 1.000 protesters gathered in front of the Prosecutor's Office of Bosnia and Herzegovina. Many young people have been arrested over the past two days. Their parents, families, friends, students and other citizens are protesting peacefully for their release. Reactionary media is holding Bosnia's other citizens in mental captivity by spreading lies minute after minute about those detained. Through social-media, the protesters are warning citizens in other towns of Bosnia and Herzegovina that they should not pay attention to what has been said on TV or any other dishonest online media. There have been many lies told about the protesters. Innocent protesters have been accused of drug possession, burning historic archives of Sarajevo, and even that they are paid by foreign entities to create fear and, ultimately, a breakdown of our country. All this is classic misleading of the public and commonplace in our nation. Nevertheless, people cannot be fooled any more. Their constant resistance shows that they have opened their eyes, and that they are not willing to surrender to corrupted politicians, regime police, or the psychological warfare of fear. Many young people are still in detention. No one has access to them. Not even their parents. Only a few were released today. They confirmed they were abused by the police. Harun Cehajic, a seventeen year old youth who was released today said: “We were beaten by the police all day. Three police officers beat us in the Judical Police premises. After that, they put us in the trunk of a car while beating our legs. We were then left in a windowless cell. Later that day, we were taken to the HQ of Police of the Sarajevo Municipality Center. They locked us in basement cells, and the two of us were constantly beaten by 8 police officers. They destroyed us.”, said the 17-year-old who spent 24 hours in police custody. Once those arrested were not released within a given time, the citizens of Sarajevo blocked the main street in Sarajevo. Now they are heading towards the House of Parliament, demanding the resignation of the Prime Minister Niksic, and the release of detained children and other citizens. Peaceful protests continue. “We speak exclusively on behalf of those of us whose human dignity and physical existence has been threatened or destroyed during the transitional robbery, corruption, nepotism, privatization of public goods. We have been enduring the economic model that favours only the rich and grotesque financial arrangements that killed all hope of social justice and prosperity of our society. We fight exclusively for order based on social justice. Take no measures which would limit the peaceful demonstrations of the citizens. The competent authorities of the Sarajevo Canton, in accordance with the Constitution and the law, must ensure the safety of all participants in the protests. Take no measures which would limit the peaceful demonstrations of the citizens. The competent authorities of the Sarajevo Canton, in accordance with the Constitution and the law, must Assembly of Sarajevo Canton, in accordance with their constitutional responsibilities, has all the necessary legal mechanisms to ensure continuity in the functioning of the executive branch. Due to negligence and irresponsible work of the previous government, we demand to form a non-partisan government. The selection process must be urgent and open to the public and shall include representatives of the citizens. The decision of the expert committee on the proposal of the representatives must be argued and based on the credibility and expertise of the selected people. Evidence of their expertise will be presented (published) to the public. If the Assembly fails to comply with this requirement by 1 March of 2014, the citizens of Sarajevo Canton will propose a new composition of the Government coordinated by these principles.ensure the safety of all participants in the protests. The actual resignation of the entire government headed by Prime Minister Nermin Niksic and the formation of non-party government by the aforementioned principles of selection. These requirements are only the beginning. In the light of our long-term goal - a society based on social justice, it will be necessary to create other fundamental changes that also can not and should not wait too long." agree, but I also find point one weird. Aren't the workers/protesters shooting themselves in the foot with that one? Nationalism will always be a danger here, but there does appear to be some clear anti-nationalist sentiment and clear proletarian concerns. This has (positively) surprised me. Without knowing much about the region due to my age and location (I'm from the cold north and was barely born before the balkan wars ended), I've always thought the whole region has struggled with nationalism and that this was almost beyond repair. Mostar was devastated during the war and ethnic tensions poisonous, but here Croats and Muslims protested alongside one another. The HQ's of the two nationalist parties, the Croat HDZ and the Bosnian SDA were both put to the torch. In Zenica politician's cars were pushed into the river and government buildings burnt. While some of the politicians have denounced the protests or tried to divide them up others have tried to "court" the protesters. Like Bosnian security minister Fahrudin Radoncic, who tried flattering the protesters while denouncing other politicians. A few years ago, Wikileaks exposed this out and out gangster and we should remember that all these "politicians", which include people and drug traffickers, are backed by elements of the EU and the USA. WSWS reports that last Wednesday/Thursday, as events in Tuzla took off, the government called on "dissatisified workers to seek to achieve their rights through syndical institutions, with whom (this) government has had continually good relations". One of the slogans painted on the demolished government building here reads "Death to Nationalism". It's a nationalism that the trade unions would have certainly supported. Edited to add: cheers for the insight baboon.. regarding Mostar, am I right in thinking there's a relatively active Antifa presence in the city? I passed through there a while back and was impressed by the amount of anti-fascist/left-wing stickers and graffiti I saw about (including some related to the local football team, who seem sort to use all kinds of Che Guevara/Antifa/Titoist imagery).. I'm from Serbia and have relatives in Bosnia, so I know a bit about the situation. Pre-war Tuzla had 20'000 Serbs, and when the war started more then 10'000 people who called themselves Yugoslavs (out of ~20'000 of them in Tuzla) also started (again) to call themselves Serbs, the rest starting (again) to call themselves Croats or "Muslims" (which was used as a name of a nation, they are now called Bosniaks) and joining the war. After the war there was ~3'000 Serbs, and the same number is today, and they did not participate and are still not participating in the protests. Concerning the protests themselves, I must say that I am dissapointed. Serbs in Republika Srpska [RS] are not participating in them, which means that the protests are almost exclusive to the Federation of BiH [FBiH] (the half of Bosnia and Herzegovina where population is almost exlusively Bosniaks and Croats). There were a few (attempts of) protests in RS, small ones, by 100-300 people, which were peaceful and mostly ignored. The government of RS is saying that the protests are not social but national, and that they are actually agaist Serbs. It can't be known how many Serbs in RS believe that, but there were no real protests in it. The same propaganda about this being nationalist instead of social protests is also being spread in Serbia, and it seems to mostly have success. I've been active online on forums and facebook groups trying to persuade Serbs to join the protests, but what I and some other people are trying there is being countered by that propaganda, especially because nationalists, which are much more numerous then leftists (and the Serbs in RS are more nationalistically inclined then Serbs in Serbia), have emphatically accepted that story and are spreading it all over the internet. There is a big difficulty with countering that. Even though there are individual voices that denounce all nationalism, a problem is with the fact that the most vocal organization that participates in the protests is "Udar BiH". It's name is the same as Klitschko's party in Ukraine (which matters because a lot of Serbs, particullary in RS, are Rusophiles and support the pro-russian side in Ukraine) , and in their calls for reducing bureaucracy of BiH they, among other things, they call for unification of the state- dissolvement of the two entities of FBiH and RS, which almost no Serbs support. In some texts of their proclamations they mention genocide committed by the Serbian side in the war- and virtually no Serb accepts that any Serb crime during the war, or all of them toghether, can be characterizes in that way; and also there is mention of an idea to replace the BiH constitution with the one that was written by the Bosniak side during the war, and all of that just reinforces the mentioned propaganda. Yesterday there was in Belgrade a protest of support for protests in Bosnia which was very small, less then 200 people, and the organization that were present ("Anarcho-syndicalist initiative" and the "Helsinki board of human rights") are disliked by the vast majority of Serbs who have any political views and know about them. Today there is another protest by a Stalinist organization ("New Communist Party of Yugoslavia") and although they are bigger and less disliked, I think it will also be a small protest. In my opinion, the problem is in the protest themselves. The voices and the proposed demands that are going around have two problems, firstly, they in some cases, as I said, reinforce the propaganda of politicians in RS and Serbia that dissuades the Serbs from supporting or joining the protests (even though ironically the people in RS are more poor then the people in FBiH and have more reason to protest), and secondly, they are all very superficial and reformist, they are about demanding resignations of current polititians, about forming legal commitees that would investigate political corruption and review privatizations and see which ones were illegal, and similar; the only demand that has would have any real effect are the calls for reduction of bureaucracy and of the amount of budget money that is used for it. There is a need for a real leftist organization that would formulate it's views so as to have mass appeal, be clearly anti-nationalist and anti-elitist, and effective in effort to teach the people how to organize democratically and articulate real social justice demands, such as that would increase welfare and make steps in the direction of direct democracy in politics and economy. Slavoj Zizek article on the protests.. he seems to be saying that there is some Serb involvement..
Last week, cities were burning in Bosnia-Herzegovina. It all began in Tuzla, a city with a Muslim majority. The protests then spread to the capital, Sarajevo, and Zenica, but also Mostar, home to a large segment of the Croat population, and Banja Luka, capital of the Serb part of Bosnia. Thousands of enraged protesters occupied and set fire to government buildings. Although the situation then calmed down, an atmosphere of high tension still hangs in the air. Some videos from Al Jazeera on the events in Bosnia.. Protesters at a detergent factory in Bosnia-Herzegovina are continuing a sit-in, amid some of the worst unrest the country has seen for years. Workers in the town of Tuzla are angry at the sale of factories, which employed most of the local population. Delilah's report was good and I entirely agree with Greenjuice about the ever-present danger of nationalism, the reformist weakness of demands and the fact that these are very much minority actions. I generally agree with Greenjuice's conclusions about a revolutionary minority (? ), though I'm not at all sure about "teaching" people. However, I think that there are positive elements to these movements that are in line with demonstratrions and protest in Egypt, Turkey and Brazil, and that they are happening in the Balkans is also important. Reuters reports today that Serbs in Belgrade have been protesting in solidarity with Bosnians. It may only be a minority but it's significant (I saw reports on the 6th - I forget where - that 30 cities were involved in protests). The Economist reported yesterday that "anything pan-Bosnian (was) not happening". But what the working class should be looking for, aimiing for, is not "cultural tolerance", ie, "let's all get on", but unified class struggle and that isn't happening yet. It's not only Russia that has backed the Serbian factions in the past (and now), but the French and the British. Barclay's bankrolled the Milosovic regime and the Serbian killers Mladic and Karodic (sorry about the spelling) were drinking partners of the British chief of staffs. So the Economist, and many other media outlets in Britain and France, will be giving the pro-Serb, anti-Bosniak line. As Delilah says, lies are being spread. The New York Times today reports that Sarajevo and 5 other cities have been severely hit. It goes on to say that the protests are reminiscent of Ukraine. The notable difference with Ukraine is the complete absence of western diplomats, delegations, politicians, "military attaches", western money and media support for the protests in the Balkans. And quite rightly too because these protests are as much about the western-imposed partition on this country after an imperialist war. EU administration offices have also been targeted and the rotten nationalist elites in Bosnia and elsewhere in the Balkans, are the placelings and partners of the major imperialisms. "News, statements and documents about protests in BH …. translated!" It's not only Russia that has backed the Serbian factions in the past (and now), but the French and the British. Barclay's bankrolled the Milosovic regime and the Serbian killers Mladic and Karodic (sorry about the spelling) were drinking partners of the British chief of staffs. That's standard, the NATO states, with USA as the head, will have great relations with anyone, no matter how bad, until it's no longer their interest. Sadam was their great pal until their interests got in conflict so they moved in to destroy him, and same with Milosevic, although he wasn't (comparatively speaking) that bad, e.g. he was nowhere near Sadam, or for that matter absolutely nowhere near the Turkish regime that was, using NATO weapons and support, committing like a 100 times worse crimes against the Kurds that the any side in the Yugoslav was committed- and the Turkish, NATO supported, attrocities were being committed in the same years and not that far from the Serbian crimes that warranted NATO intervention. There's on YouTube three great interviews of Chomsky about the Yugoslav wars, and there's also on YouTube a whole film called the Weight of Chains which gives great info about the NATO preparations and involvement in causing the breakup of Yugoslavia and the war. Concerning the protests, a (maybe not so small) update, in some cities where the protest were held, including Tuzla where they started- there were yesterday and today a few of democratic assemblies of protesters that happened, and that might be significant. (Interestingly they are called "plenum"s, which is a term that nicely got into mainstream of protest from the discourse used by LibSoc organizations in Croatia and Bosnia) There will be also more of them in the following days, and they will be about discussing protest strategies and most importantly- formulating protest demands. At least, that will give structure to the voice of the protests, and take the ammo away from the Serbian political systems in RS and Serbia in their propaganda that is, as I mentioned, based on demands and rhetoric of some small organizations that participate in the protests. Hopefully, they will also formulate the demands in the direction I mentioned in my last post, in the direction of LibSoc. Another (also maybe not so small) update about the situation in Serbia. In Kraljevo, a major junction city, workers of two major factories, that were on strike for six months now, have blocked the railroad. The workers are mainly self-organized, there is no yellow union organising them, and although there was no word of Bosia and solidarity with the protest there, the choice of the day to do this is interesting. What is also interesting is that although Kraljevo is a very important economic junction, that railroad especially, the cars from Fiat factory are moved by it, this protest is largely ignored by big media. Thanks for the update green, sounds very interesting. Please keep us informed! Rise of the workers' anger in Serbia? While in Kraljevo, the factory workers Wagons block this Feb. 12 line railroad, more than a thousand workers Jumko factory in Vranje blocked the highway that day Belgrade-Skopje at the village Bresnica. Workers demanding payment of their wages and obtaining their rights to health insurance. On strike since January 13, they began to radicalize their action on February 5 by demonstrating outside the assembly of Vranje. Interesting videos included in this article that are worth watching..
Bosnia On The 8th Day Of Anti-Government Protests. Video Interviews. I've wrote an article on English regarding situation in Bosnia. It will be up in day or two and then I'll post it here. post from sarajevo on here. hopefully to be updated next week! we can get it out to about 500 folk a day.